Sea salt comes in a number of varieties and colors. Sea salt is the salt obtained from the evaporation of ocean water. The practice has been utilized for thousands of years. Sea salt is one of the two primary ways to obtain salt, the other consisting of mining deposits found on land. Sea salt is around 98% sodium chloride, as opposed to 99.9% for table salt. 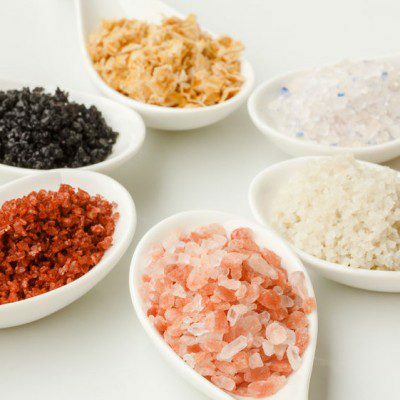 The remaining two-percent represents various trace minerals that can give salt any number of different flavors. Sea salt is a natural product. It is directly obtained from evaporation of ocean water. It contains 98% sodium chloride and two percent other trace minerals. Sea salt production primarily occurs in hot, dry atmospheres. While it is possible to make sea salt via commercial equipment, such a process is much more energy and capital intensive. Thus, the Mediterranean region produces the majority of sea salt around the world. The salt is made by filling large pools with salt water and then letting them dry entirely. Debris sinks to the bottom of the pool, allowing the salt to come off the top with ease, yielding a more pure and simple harvest. The top salt derived from such a practice is a very expensive salt called fleur de sel. What is Sea Salt Used For? Sea salt is used widely throughout the world and is seen as a superior grade salt in the United States. Chefs often use it to give their dishes more interesting colors, textures, and flavors. A large part of why the taste changes is because sea salt has a slower dissolution rate. How is Sea Salt Used in Baking? Salt addition to baking strengthens the dough and enhances bread flavor. Sea salt can be used in most recipes that call for table salt. It also has uses in the cosmetic industry as an exfoliator. Sea salt is typically coarser than table salt. So if using it in bread or candy, it is important to use the same weight, because volumetric measurements will not be the same. Also, a small amount of extra salt may need to be added if using sea salt. In either case, it is vital to maintain a healthy lifestyle and not to over use salt. High sodium intake is directly associated with high blood pressure, which is a major risk for cardiovascular disease. Low sodium sea salt is available for baking. A commercial low sodium sea salt, which is comprised of 31-35% magnesium chloride (MgCl2), 21-26% potassium chloride (KCl) and 5% NaCl, can be used replace salt in bread making.1 Compared with salt, the low sodium sea salt doesn’t inhibit yeast fermentation. Its addition has no influence on bread volume. The Nutrition Facts label that appears on food packaging also lists the “% Daily Value” for sodium. Look for the abbreviation “%DV” to find it. Food listed as 5% or less for sodium are low in sodium. Anything above 20% for sodium is considered high. Try to select foods that provide 5% or less for sodium, per serving. Simsek, Senay, and Maribel Ovando Martinez. “Quality of Dough and Bread Prepared with Sea Salt or Sodium Chloride.” Journal of Food Process Engineering 39.1 (2015): 44-52. “Consumer Updates – Lowering Salt in Your Diet.” Office of the Commissioner. U.S. Food & Drug Administration. 29 Mar. 2016. www.fda.gov/ForConsumers/ConsumerUpdates/ucm181577.htm. Accessed 24 Feb. 2017. “Laws, Regulations, and Guidance – Guidance for Industry: Colored Sea Salt.” U S Food and Drug Administration. Center for Food Safety and Applied Nutrition, 01 July 2016. www.fda.gov/ForIndustry/ColorAdditives/GuidanceComplianceRegulatoryInformation/ucm464600.htm. Accessed 24 Feb. 2017.